This directory covers the changes in the BNSF Railway locomotive fleet from 2017 through March 2018. Locomotive re-numberings and retirements plus other technical data help the railfan and railroad modeler know the BNSF fleet. 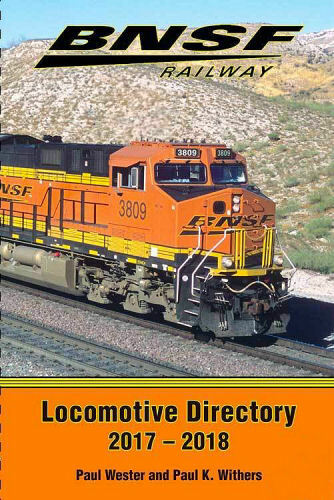 Currently the BNSF fleet consists of 8,125 locomotives and 11 slugs, using official BNSF records. Additions, retirements, and renumberings to BNSF’s locomotive fleet are all covered. They are listed and many photographs of them are presented here. Includes one page on the Houston Belt & Terminal. Soft cover.